I realize that in order to get the public to read your articles and look at your photos, you need a catchy headline – something that people can easily recognize and remember. I fail to see how that need translates into using an offensive comparison to label such a young baby. Yes, his rolls make him look like the Michelin Man – I get it – and maybe my time on the internet has led me to become hyper-sensitive to insult and shaming to the point where I imagine it. Can you even shame a 10 month old? Is it shaming to his parents? Should it be? That sounds like a typical 10 month old to me. Maybe Qingyu has been misreading Lei Lei’s signs of teething for hunger, maybe Lei Lei has a thyroid issue, maybe it’s BPA or formula related (although Qingyu says he’s breastfed.) Whatever the issue is, however, doctors are studying him, the medical field is searching for the answers, and they should be the ones passing judgment and doling out advice – not the internet masses. I have to admit, it’s a lot easier for me to sit back at my computer screen and judge the news operations and the bloggers slowing down to stare at, point at, and make generalizations about a baby before they know all the facts. This may not be a 20th-century circus, but when I turned my computer on this morning, I certainly felt like I was at an old-fashioned freakshow. 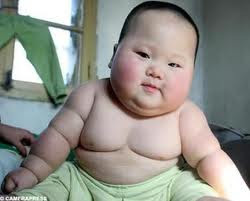 Did you know that Michelin Tire Baby Syndrome is an actual medical condition? The syndrome is also named for the sufferer’s similarity in appearance to the Michelin Man, but it has nothing to do with obesity. It’s a rare skin condition where babies are born with folding skin and scarred tissue. This means that not only is the blogosphere using a catchy, if insulting comparison, to a big, puffy cartoon with rolls, it’s also completely trampling on a term already in use for an actual set of symptoms for an entirely different condition. Like I said before, maybe I’m being a bit too sensitive, but many of the blogs I’ve read concerning Lei Lei say nothing about the possible causes of his rapid weight gain. Perhaps, if they want to be fit for public consumption, they should provide some information on baby weight statistics, guidelines, possible causes, and tests that are being done. Perhaps they should give advice to other parents concerned about their young ones’ health, fitness and weight, or provide tips on what doctors recommend a baby’s diet be. Perhaps they could do just a little research before using a catchphrase that’s already in use. Perhaps they should do more than shout as loudly as they can: Look at that huge baby! Oh my God, he’s huge! Here’s a picture! Perhaps the baby, the parents, and the public deserve just a little better than that.